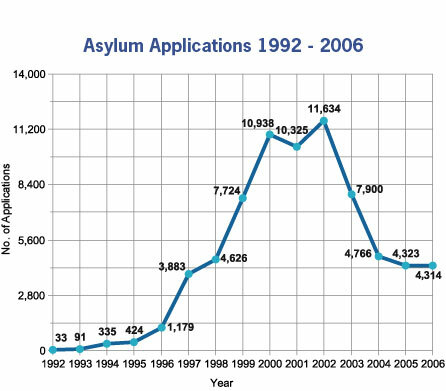 This graph shows the numbers of asylum applications from 1992 to 2006. The cost of the asylum system in Ireland is now in excess of €375 million per annum. Although about 90% of asylum applicants are rejected ans should be deported, only 1 in 5 deportation orders is implemented. "A small but well placed minority of commentators have sought to create the impression that Ireland's treatment of asylum seekers is harsh and unfair. They have consistently concealed the real facts from the Irish people. Moreover, they have sought to create the impression that anyone who points out the true situation is engaging in political racism. They hint at international comparisons which do not exist. They refuse to address the very large abuse of asylum protection in Ireland. They claim to believe that it is wrong to point out what is happening lest it create prejudice against genuine asylum seekers. They are engaging in a form of verbal intimidation of those who would tell the truth."